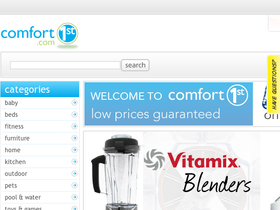 Be your most comfortable with products from Comfort 1st, online at ComfortFirst.com. From beds to coffee makers, from loungers to massagers, from cookware to air purifiers, Comfort First has everything you need to make your house a home. If you like to exercise to relax, they have fitness equipment and golf clubs. For pet enthusiasts, they have pet strollers and pet beds. With such a variety, be sure to check out Comfort First. Before you do that, stop by RetailSteal.com for the top Comfort First coupon codes, Comfort First discounts, and Comfort First promotions. ComfortFirst.com offers free shipping on thousands of products. If you're unhappy with something you've bought from Comfort First, you can return it within 30 days of your purchase. See site for full details on return policy, exclusions may apply. Use this coupon code at ComfortFirst.com and enjoy a $15 discount on your order of $300+. Act now and save $10 off your order of $200 or more with this coupon code from Comfort1st.com. Enjoy free shipping on thousands of products from Comfort 1st. Click link to start shopping. Receive a free Sunshine Kids Dry Seat with your online Car Seat order of $200 and the coupon code at Comfort First. Click link to place order. Shop at Comfort First and receive a free car vacuum when you spend $150+. Use coupon code for your free gift. Save up to 35% or more on toys from brands like KidKraft, Angeles, P'kolino, and more. Shop today. Check out the closeout sale at ComfortFirst.com and take advantage of up to 90% off a wide variety of products. Take 50% off on closeout, outdoor products online at Comfort First. Click link for savings. Click our link to shop online at Comfort First today and enter our coupon code at checkout to save 5% this summer. Purchase a dot or navigator stroller from Comfort First and get a free double stroller kit. Enjoy a 10% discount on strollers when you enter our coupon code at checkout at Comfort First online. Don't miss out on this discount. Shop ErgoBaby carriers at Comfort First online today and use our coupon code to enjoy 10% savings on this purchase. Hurry over to LNT.com and save $25 and receive free shipping on your order of $199 0r more with this coupon code. Shop at Linens 'N Things and enjoy 25% savings on your order. Click here for code. Shop at Linens 'N Things and enjoy 20% savings on your order. Click here for code. Save up to 70% on clearance items online at Linens 'N' Things. Click link to buy. Shop at Linens 'N Things and enjoy $15 savings on orders $75+. Click here for code.